This activity requires students to practice math skills by measuring the surface area and the volume of boxes. Collect boxes for students to use, these can be any type of box, such as tissue boxes, food boxes, or shoe boxes. Ideally, you want a range of sizes, with at least one box being overly large. Students then complete a table where they share their calculations with other groups and calculate the surface area to volume ratio. It should become apparent that the smaller boxes have a much smaller ratio. Students can apply this knowledge to the cell membrane, referencing the concept that materials such as oxygen must be transported across the membrane. Students answer questions about cell size and why cells remain small by referencing their observations from the activity. 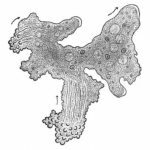 A final question asks why an irregularly shaped amoeba can be larger than other cells and asks students to imagine a way they could measure the surface area. This also provides an opportunity to set up stations for students to view living or preserved amoeba. Protists are not included in NGSS, but they remain a popular subject to study among my students, so I try to sneak them in when I can piggyback them into other lessons.